How do you split things between your different inserts/notebooks in your Travellers Notebook? The job TN: month calendar for 14 months, day calendar for two months, notes. The private TN: journal, notes, lists. Well I've just started using my Field Notes size Raydori to see how I get on, and I must admit I'm enjoying the freedom a ring-free notebook gives, as its so much easier to write unhindered. In the cover I have a zipper pocket and kraft file behind the elastic, but my three notebooks/diary are loose within so I can take one out to write in. I have a WOTP diary, which I find ideal, a book of information which I need most days, and then a note book in which I write ideas, things to do etc., and I have to say nothing falls out! 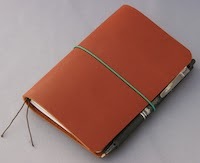 I only wish I could find a suitable way to carry a decent pen or pencil, as I'm not convinced I will like a Midori pen loop. I have 2 TNs: I have a FN TN is my everyday carry, and it contains an insert filled with info I need often, like birthdays and anniversaries, goals, website tracker, and projects for writing. Next, I have a double-thick graph insert for my Bullet Journal. After that, I have MO2P through Dec 2015. Lastly, I have a Lists insert for lists I want to refer to often and need to be with me after my bullet journal is filled up and replaced with a new one (usually, these lists are contained within the bullet journal) My lists include things like books I want to read, wishlist, Patriots Football game schedule, Christmas gift ideas list, etc… I also have a dashboard, card holder, pocket folder, and page protector placed in there. My 2nd one is a regular-sized TN, which is my "creative" book. This stays at home, unless I'm going on a trip. It contains my commonplace book, traditional journal/smash book, an insert for ebook story ideas and outlines, and an insert where I keep notes on the crystals I'm teaching myself about.